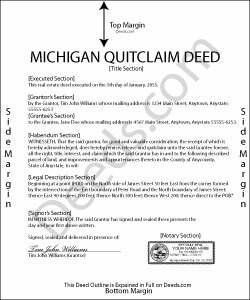 A quitclaim deed in Michigan must be duly signed, sealed, and acknowledged by the grantor in order to operate as a conveyance in fee simple to the grantee, his heirs, and assigns (MCL 565.151). In the words of conveyance, provide a legal description of the real property as well as the consideration exchanged for the property (MCL 565.151). The name and address of the person who prepared the instrument must also be listed on the first page (MCL 565.201a). Section 565.201 of the Michigan Compiled Laws outlines formatting and content requirements for quitclaim deeds executed in the state. Further, it is important to include a statement of the marital status of any male grantors involved in the conveyance. A register of deeds in Michigan can refuse a quitclaim deed for recordation if this information is not provided (MCL 565.221). The act of recording a quitclaim deed with a register of deeds places it in the public records. An unrecorded quit claim deed is void as against a subsequent purchaser, in good faith and for valuable consideration, of the same real estate whose conveyance is first recorded. The fact that the first recorded deed of the same real estate is a quitclaim deed does not affect the question of good faith of each subsequent purchaser, or be of itself notice to the subsequent purchaser of any unrecorded conveyance of the same real estate (565.29). Robert J. F. said: Nice work. Easy to use site for reasonable price. Thank you. Reply from Staff: Thank you for your feedback Michael. We do wish we could make that an option. Unfortunately, adhering to formatting requirements (specifically margin requirements) leaves a finite amount of space available on the page. Dennis E. said: Easy to complete form. Examples were very helpful in using correct verbiage for form. Also way less expensive than the $500 an attorney wanted to charge me for doing the very same thing!!! Reply from Staff: Thanks Dennis, we appreciate you taking the time to leave your feedback.